Yesterday (Fri. February 2, 2019) we noted that Jose Aldo suggested a fight with Anthony Pettis. The pair were supposed to fight several years ago when they each reigned as the UFC’s featherweight and lightweight champions, respectively. However, the fight never came to fruition. Since, both men have been dethroned from the top of their divisions, and are now fighting their way back up the rankings. However, Aldo is nearing retirement, and has only a few fights left on his UFC contract. Pettis is currently gearing up to make his welterweight debut in a thrilling striking contest against former welterweight title challenger Stephen “Wonderboy” Thompson. They’ll headline UFC Nashville on March 23rd. Promoting his fight tonight (Sat. February 2, 2019) in the co-main event of UFC on ESPN+ 2, Aldo spoke to media recently and discussed his upcoming retirement. 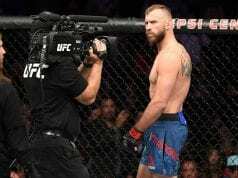 He revealed he was offered a fight against Donald “Cowboy” Cerrone, however, the fight never happened as the UFC seems to be wanting to go in a different direction now. Aldo will face Renato Moicano in the co-main event of tonight’s UFC Fortaleza card. He comes off a big TKO victory over Jeremy Stephens this past summer, his first victory since 2016.